Figure 10.30 Nothing says gentlemanly, amateur sports like cricket, especially when it’s being played at Upper Canada College. Social class barriers stood in the way of cricket becoming the professional and commercialized product that it became in other Commonwealth countries. Canadians might agonize over American and other influences on their culture (they did, and they still do) but one area that has remained largely exempt in that regard has been sports. Whether it is ice hockey or Canadian football, issues of national cultural integrity are seldom as intense as they are with regards to content on radio or television. Robin Anderson and Russell Field explore aspects of sport history and the history of spectatorship in Sections 10.16 and 10.17. What both identify as critical in modern sports is the speed with which commercialization became not only their defining feature but also the surest test of their quality: if you have to pay money to watch it, it must be good. There were exceptions in the 20th century, and curling is merely the first that comes to mind. Lacking the explosions of activity that made for good radio and difficult to professionalize until the late 20th century, curling persisted as mostly a participant sport. 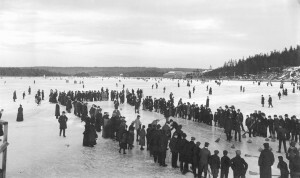 Figure 10.31 Enormously popular in places like Dartmouth, NS, curling was nevertheless slow to professionalize. Even as an amateur sport it had a low profile: it arrived at the Winter Olympics in 1924 and then disappeared until 1998. Of the masculine sports, Canadian rugby’s two branches offer perhaps the greatest contrast. In the 1880s, college teams from Ivy League institutions in the United States challenged Canada’s premier university at the time — McGill — in what started out as something very much like English rugby but which quickly acquired distinctive features on both sides of the border. The mutated versions emerged as Canadian-rules and American-rules “football”. The link between true rugby and the Canadian Football League is to be found on the Grey Cup itself, said to be the oldest trophy in professional sports: it is awarded annually to the best team in the Canadian Rugby Union. The cup has been stolen on at least two occasions: it is either a myth or a public secret that it was abducted by members of the Canadian Rugby Union (aka: Rugby Canada). Both English rugby and Canadian rugby remained amateur sports until the mid-1950s when the Canadian variant became the Canadian Football League (CFL), a fully professional operation comprised of separate eastern and western unions. Rugby retreated to university campuses and private clubs, although football by the mid-century had a grip on varsity sports as well. 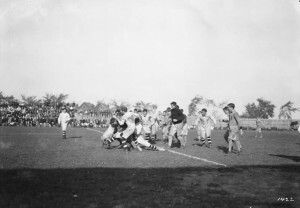 Figure 10.32 Ottawa meets the Hamilton Tigers in a 1910 “football” game that looks a lot like rugby. Lacrosse offers a contrary example of a sport that was widely played, quickly professionalized, and progressively marginalized. Lacrosse enjoyed its best years as a spectator sport in the pre-1914 period. By the 1920s, the game was moving indoors and was becoming professionalized, typically as an arm of existing pro-hockey teams like the Canadiens, the Maple Leafs, and the Maroons. Despite the game’s current status as one of Canada’s two national sports, it has repeatedly failed commercially; clubs have folded and been revived, and it is sustained mostly by a rabid (if small) fan base. What challenges lacrosse is the same thing that vexes the CFL: a limited television market. The most profitable pro-leagues in North America have capitalized on advertising revenues to such an extent that watching public sports in a private space (the home) has come to define the supporter experience for Americans and Canadians. The size of a sports corporation’s profits were once tied to the number of fans they could bring into an arena or stadium; that has not been the case since the 1960s for the NHL, American football, or professional baseball. As Anderson points out in Section 10.16, the history of Canadian sports is intensely gendered. The intersections between the body, athleticism, the marketplace, and the crowd are facets of sports in the modern world that have drawn attention from historians, and on which much research remains to be done. One of the features of the modern world is the rise of massified spectator sports. These shifted the balance from the value of athleticism as a means to personal development to the commercial opportunities of arena sports and advertising revenues. 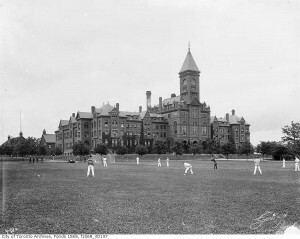 Cricket, Upper Canada College, Forest Hill by Toronto History is used under a CC-BY 2.0 license. 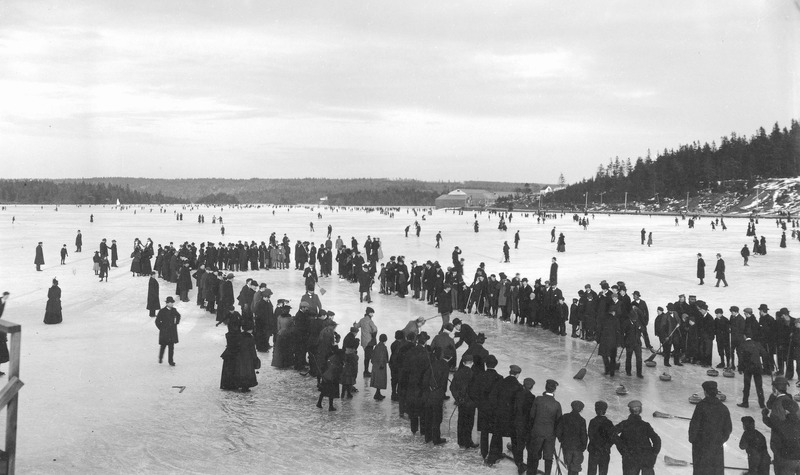 Curling on a lake in Dartmouth, Nova Scotia, Canada, ca. 1897 by W.L. Bishop is in the public domain. 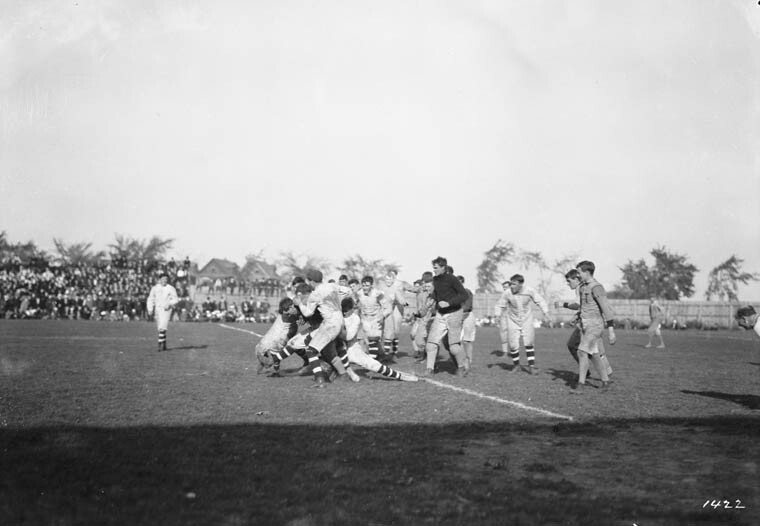 Ottawa and Hamilton Tigers football game (Online MIKAN no.3386005) by William James Topley / Library and Archives Canada / PA-009601 is in the public domain. Previous: 10.14 A Culture under Siege? 10.15 The National Pastime(s) by John Douglas Belshaw is licensed under a Creative Commons Attribution 4.0 International License, except where otherwise noted.